Falafel, the Middle Eastern fast food staple, is one of the food staples most closely identified with Israeli cuisine. Crisp and speckled with herbs, chickpea-rich falafel balls are Egypt’s contribution to the Levantine street food culture, usually nestled inside fluffy pitas. With time, as Israel’s culinary scene evolved and started playing up its key assets, falafel has found itself on several fine-dining plates, as a placeholder for new flavors; modern Tel Avivian restaurants now infuse it with eggplant, beets and other variations, and serve it on ‘beds’ of yogurt and sauces. A very un-kosher shrimp falafel is a thing as well; just ask star chef Marcus Samuelsson, whose 2014 book Marcus Off Duty: The Recipes I Cook at Home includes a recipe for one. But for all its adventurous reincarnations, falafel always stayed true to its form — that is, it has remained reliably round and portioned in the form of familiar, delectable balls. Until now, that is. A couple of months ago, a sensation stormed the Israeli food scene, blazing through social media and making several TV appearances. Falafel Belgi (Belgian falafel), out of Rishon LeZion, a sprawling city near Tel Aviv, is a new eatery turning the tables on the traditional falafel concept. Instead of treating falafel’s familiar chickpea mash as the filling, the folks at Falafel Belgi pour falafel batter into a Belgian waffle mold and turn it into the vehicle for salads, pickles, and condiments: tahini, spicy pesto, and lemony spicy carrot salad, to name a few. (#2) Watch it being made! In North America, Belgian waffles are a variety of waffle with a lighter batter, larger squares, and deeper pockets than ordinary American waffles. Belgian waffles were originally leavened with yeast, but baking powder is now often used. 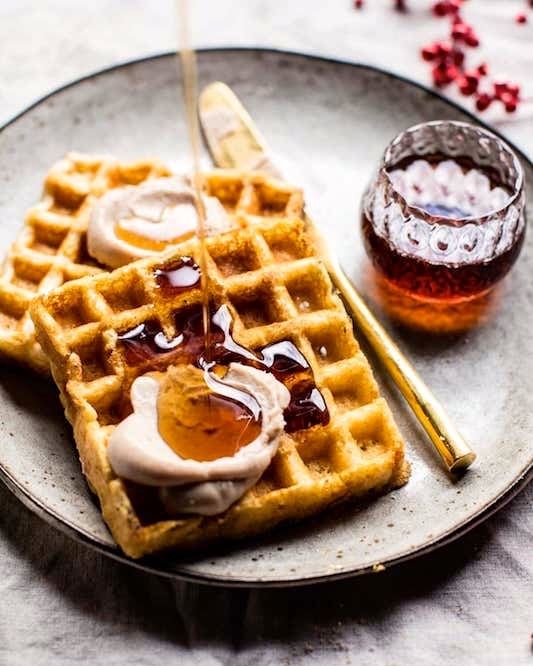 They are often eaten as a breakfast food; toppings vary from whipped cream, confectioners sugar, soft fruit, and chocolate spread, to syrup and butter or margarine. They may also be served with vanilla ice cream and fresh fruit (such as strawberries) as a dessert. 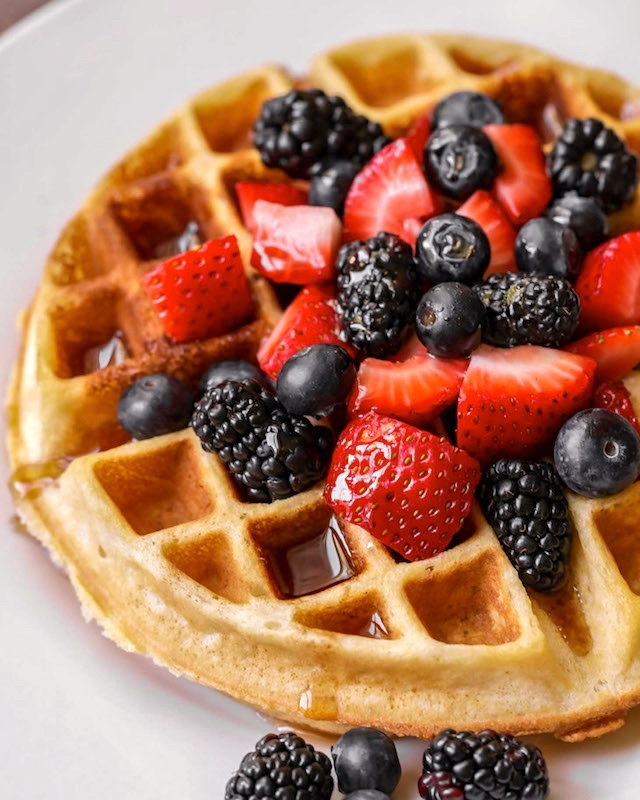 … Originally showcased in 1958 at Expo 58 in Brussels, Belgian waffles were introduced to North America by a Belgian named Walter Cleyman at the Century 21 Exposition in Seattle in 1962, and served with whipped cream and strawberries. The waffles were further popularized in the United States during the 1964 New York World’s Fair at Flushing Meadows Park in Queens, New York City. 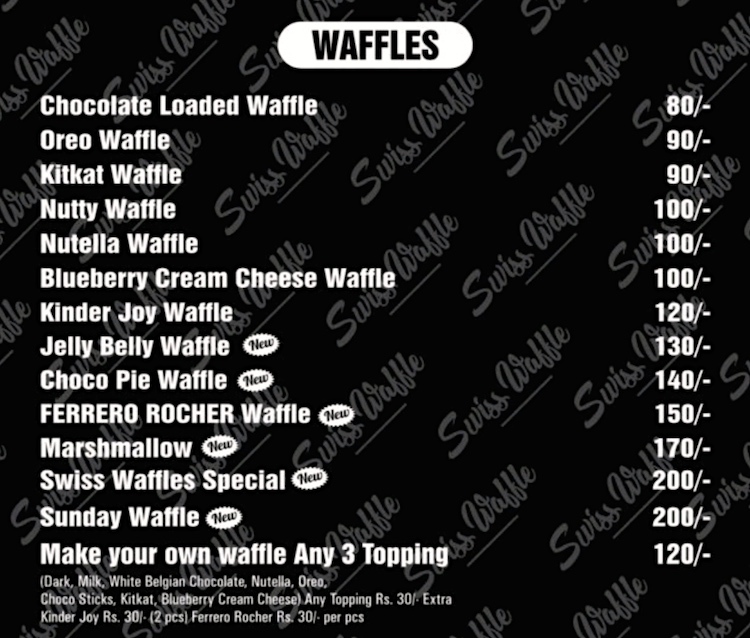 These waffles were introduced by Maurice Vermersch of Brussels, Belgium. [“His waffles made memories at the Queens World’s Fair”. Newsday 1989-08-22]. Largely based on a simplified recipe for the Brussels waffles, Vermersch decided to change the name to the Bel-Gem Waffle upon observing that many Americans could not correctly identify Brussels as the capital of Belgium. These waffles were served with whipped cream and strawberries, and they were sold for a dollar. Swiss waffles. Well, I thought, if Belgian waffles, why not Swiss waffles? (I slip easily into Swiss mode.) Of course, there are ham and Swiss waffles, turkey and Swiss waffes, bacon Swiss waffles, and so on, in which Swiss is short for Swiss cheese. 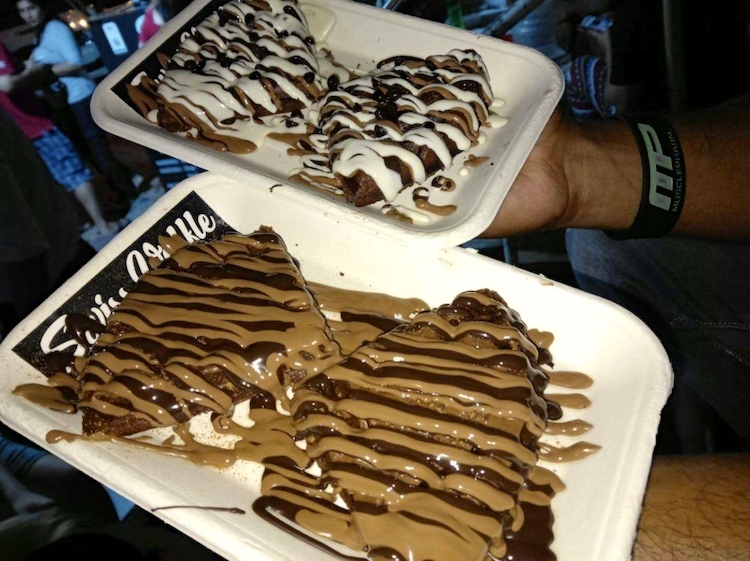 Beyond that, there’s food called Swiss waffles in which the Swiss is an allusion to something characteristically Swiss, or at least popularly believed to be; the allusion lies in what’s served on the waffles (rather than in the waffles themselves). 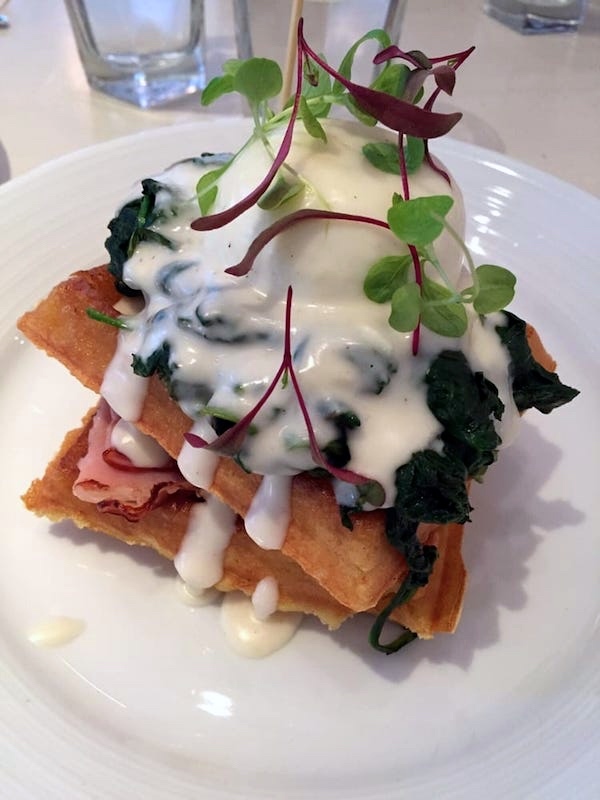 At the very least, there are savory Swiss waffles, with fondue on them. And there are sweet Swiss waffles, with sweet stuff, especially chocolate (always evocative of Switzerland), on them. International ingredients: Oreo cookies are American, Nutella spread is originally Italian; Kit Kat chocolate-covered wafer bars are originally from York, England; Jelly Belly jelly beans come from northern California; and Ferrero Rocher is an Italian chocolate and hazelnut confection. And they all end up in Mumbai, on top of waffles. goffer goes back directly to gaufrer, alluding to a goffering iron as a patterned tool, and gaufrer alludes to a particular pattern, the honeycomb (French gaufre); meanwhile, French gaufre ‘honeycomb’ is the source of English gopher, a creature so-called because of its honeycomb-like burrows. And gaufre is a borrowing from Germanic (in a word that shows up in English as waffle, again with a honeycomb-like pattern), with the same French /g/ correspondence to Germanic /w/ that we see in guerre (as in English guerilla) and English war, garde (taken into English as guard) and English ward, and some other pairs. I learned about the gopher-waffle connection from Paul Kiparsky many years ago, and I still think it’s way cool. This entry was posted on December 19, 2018 at 3:50 pm and is filed under Etymology, Language and food, Names, Switzerland and Swiss things. You can follow any responses to this entry through the RSS 2.0 feed. You can leave a response, or trackback from your own site.